Just to be fair… I tasted these whiskies three month ago and I have been waiting to write this article until I can secure a bottle of one of them. Most of you know that I love Amrut whiskies but these single casks are really fantastic. Since I tasted my first Amrut three years ago each one I have drank has impressed me in one way or another, their peated malt, their cask strength, their strange cask managements. Also I have to say that I love the way the bottles look. 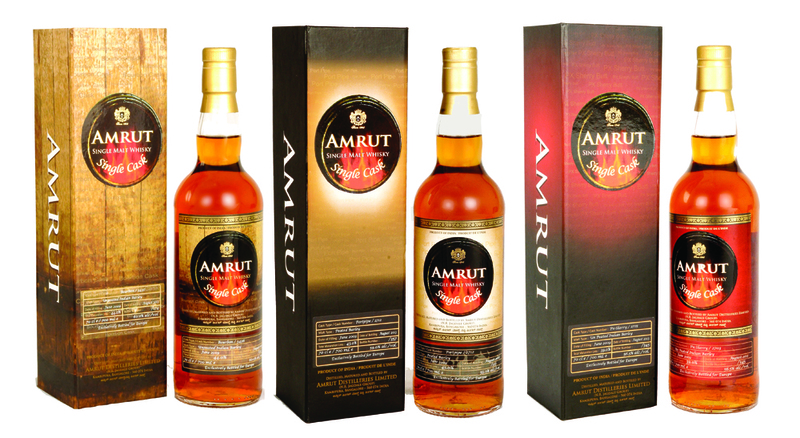 But about the whiskies… i tasted three Amrut single cask… you guessed it… at TWE Whisky Show 2013. Nose (91): more than average. honey, citrus, vanilla, spices, mango, sandalwood. Palate (92): powerful, oily. honey, wood, vanilla, fruits, mango, strawberries, liquorice. Finish (91): longer than average. malt, wood, oranges. So based on other whiskies I have already tasted I rate this Amrut Single Cask Bourbon #3439 with 91 points over 100. Nose (91): more than average. nuts, honey, citrus, malt, spices. Palate (92): powerful, oily. nuts, spices, citrus, honey, cinnamon, chocolate. So based on other whiskies I have already tasted I rate this Amrut Single Cask Sherry #2699 with 92 points over 100. Nose (91): more than average. honey, pastry, cinnamon, vanilla, peat, citrus, floral. Palate (90): powerful, oily. honey, spices, wood, citrus, cocoa, peat. So based on other whiskies I have already tasted I rate this Amrut Single Cask Port Pipe #9713 with 90 points over 100. I wish that every tasting would be like this. Three fantastic whiskies in a row. Not everyday is as nice as this.